I mentioned in a previous post that I'd found a chest of drawers on the side of the road. Coming back from the beach I saw it, legs in the air and drawers strewn across someone's front yard, and thought, she's perfect! When you're learning to paint furniture, what's better to work on than a free dresser! At some stage she must have had a mirror attached to the top, given the shape of her back legs, so I'll keep my eyes open for a replacement. 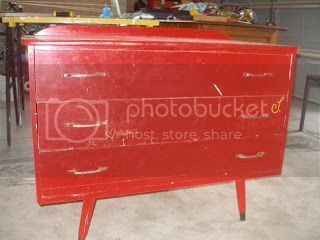 As I'm sure I probably would have done given the chance as a teenager, the dressers' previous owner had painted her name all over. Including on the inside back of the frame. 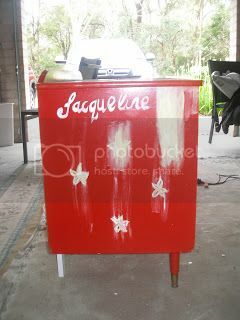 Hence we're calling her Jacqueline. I've had these two gorgeous dressers pinned on pinterest forever. I wavered, but in the end decided to go with my original inspiration. Emma is happy and so am I. She has some... ahem... blemishes, but we'll look past those won't we! So that gets the ball rolling for Emma's room - hooray! I'm linking to Primitive & Proper, Make Grow Thrift by The Habby Goddess, Miss Mustard Seed, and Primp Your Stuff Wednesday. Thank you for playing along with Make Grow Thrift, yes there is a wee problem with the linky tool - it will be fixed for next week. Thanks Jodie - working on something else to share for Monday! Love the dress you shared BTW, I have that book, now I have the inspiration! I tried to convince her on mauve / purple, or greens, but without question she wanted pink! Sounds great - 'see' you soon! So Cute! That was so creative! that is flippin' fabulous! what a great shape and i love the color grading on the drawers. and the dipped legs. fabulous! That looks awesome! I love what paint can do! Gorgeous! I always love the ombre look! She really got a nice change! Hi Catherine - Bronnie has been raving about how talented her sis is :) Love your inspiration and the final outcome! Emma is so lucky to have a crafty and thrifty mum. I have those very same inspiration photos pinned! An ombre piece is defintely on my to-do list too! I love that style dresser and I love that you found it and gave it a new life. The pink is sooo cute! Nicely done! Hope you'll come by and link up to our Tuesday Be Inspired party sometime! Just stopped by from Primitive & Proper! 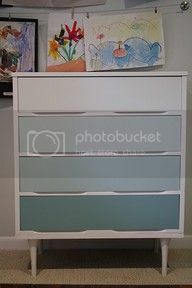 I love the ombre dresser!! Love the style, the color - everything! Great job!! Awesome Catherine!!! Congrats on the feature at POWW too!! It turned out so great...one you can cross off your list! Jacqueline is oh-so-pretty in pink! love this Catherine!! So pretty! You did a really beautiful job! Thanks Shelly - gotta love the free stuff! Great Redo, first time visting, lucky little girl! 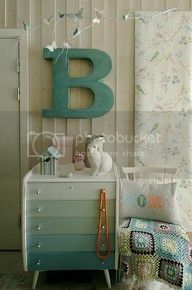 I LOVE this dresser remake. Just found your site from you being featured on Prim & Proper. SO glad I found you- I am your newest follower!! Hi Rasonda! Thanks so much - I love it too! I have that same pin on one of my boards, but haven't done anything with it yet. :-) This looks great, you did a fabulous job! ah! I love this! You are really making me want to find some furniture to mess around with - I also love the desk you did for your husband! Love, love, love this! I have had the same pins on Pinterest! 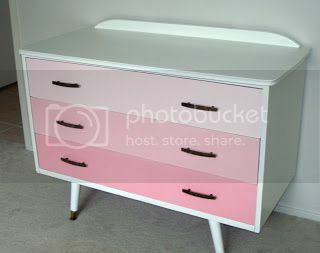 I'm starting my little girl's big girl room, and I am wishing she had a dresser instead of an armoire, so that I could do ombre! Great job (and I love the dresser you found)! Oh my word- this turned out so well! I've seen people do them, but the shades are off. Yours look PERFECT!! Love. It. wow… quite a transformation! Please share your projects at www.creativecraftsthursday.blogspot.com each and every week and check out what other creative divas are up to. WOW - you have done a beautiful job! Wow - it looks great - you have done a lovely job!